Wal-Mart Offers Veterans Jobs, Expects To Hire 100,000 Over Five Years : The Two-Way The retail giant employs about 1.4 million people in the U.S. Starting Memorial Day, it says it will have jobs for any veteran who has been honorably discharged and applies for work within the first year after going off active duty. The scene in a Wal-Mart store in Alexandria, Va.
Saying that "hiring a veteran can be one of the best business decisions you make," Wal-Mart U.S. CEO Bill Simon confirmed this morning that the retail giant is launching a plan to hire more than 100,000 recently discharged veterans over the next five years. According to the company, "beginning Memorial Day, [it] will offer a job to any honorably discharged veteran in his or her first 12 months off active duty. Most of these jobs will be in Walmart stores and clubs, and some will be in distribution centers and the Home Office." Simon, speaking at the National Retail Federation's annual convention in Manhattan, said that "not every returning veteran wants to work in retail — but every veteran who does will have a place to go." He spoke of having both part-time and full-time positions available for those who wish them. Simon, who served in the Navy as a young man, said he "can think of no better group to lead in revitalizing our economy than those who have served in uniform." "The unemployment rate for veterans of the recent wars has remained stubbornly above that for nonveterans, though it has been falling steadily, dropping to just below 10 percent for all of 2012. That was down from 12.1 percent the year before. The year-end unemployment rate for nonveterans was 7.9 percent in 2012." 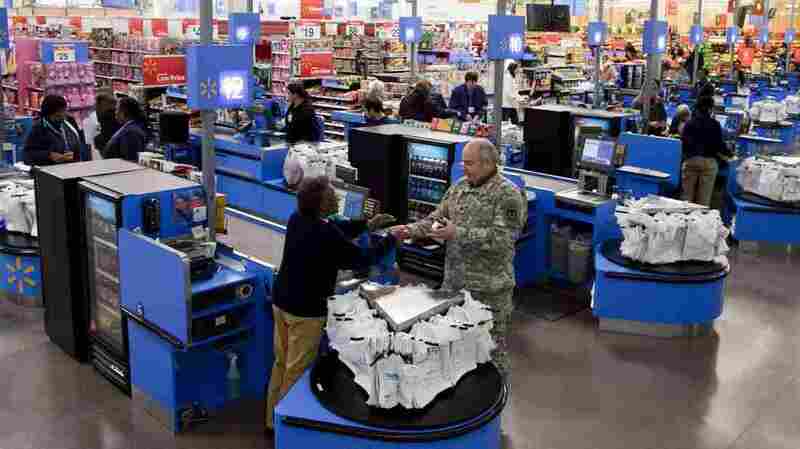 Wal-Mart now employs about 1.4 million people in the U.S.
Related story from Morning Edition: "Training Program Aims To Prep Soldiers For Civilian Jobs."